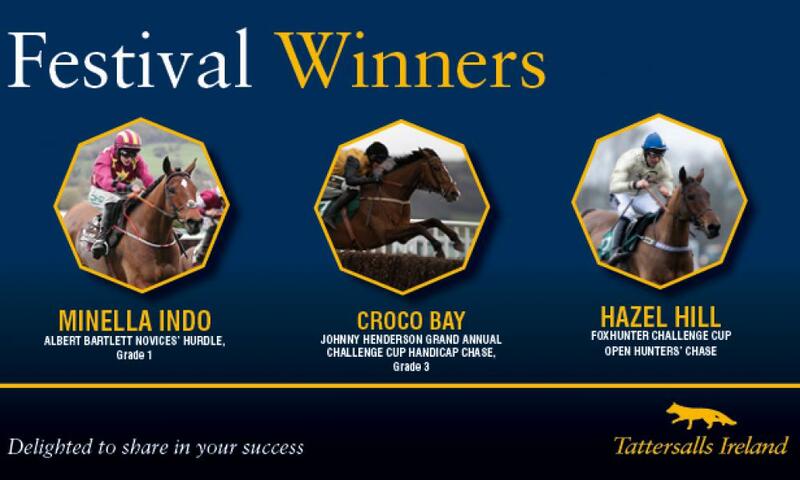 The Cheltenham Festival concluded with eight winners for Tattersalls Ireland, three on the final day of the Festival. In the Gr.1 Albert Bartlett Novices' Hurdle, Henry de Bromhead's MINELLA INDO won with authority giving jockey Rachael Blackmore her first Grade 1 success in the colours of Barry Maloney. The six-year-old by Beat Hollow was sold at the 2013 November NH Sale by Rathkenty Farm to John Nallen for €24,000. Dubbed as the "Amateurs Gold Cup", the St. James's Place Foxhunter Challenge Cup Open Hunters' Chase went to HAZEL HILL, trained by Philip Rowley, jockey Alex Edwards and owner Mrs D Williams. HAZEL HILL was offered at the 2012 November NH Sale by his breeder Paddy Moakley. The Gr.3 Johnny Henderson Grand Annual Challenge Cup Handicap Chase went to yet another Tattersalls Ireland graduate with Ben Case's CROCO BAY winning the contest under Kielan Woods for Lady Jane Grosvenor. CROCO BAY was sold at the November NH Sale by his breeder Dan Caverley for €4,200 to Simon Donnelly. Sold at the November National Hunt Foal Sale by Borris House to Goldford Stud for €18,000.